We’re counting down the days to the 2016 Thoroughbred Makeover and National Symposium, organized by the Retired Racehorse Project (RRP), a nonprofit dedicated to the placement of ex-racehorses in second careers, and sponsored by Thoroughbred Charities of America. You can join thousands of others who believe that every Thoroughbred deserves a chance to win at life at the beautiful Kentucky Horse Park in Lexington, Kentucky, October 27-30, as top trainers engage in the process of transitioning ex-racehorses to second careers. The Thoroughbred Makeover serves as the only national gathering of the organizations, trainers, and farms dedicated to serving OTTBs and features educational clinics and demonstrations, as well as the Makeover Horse Sale and the $100,000 Thoroughbred Makeover competition. 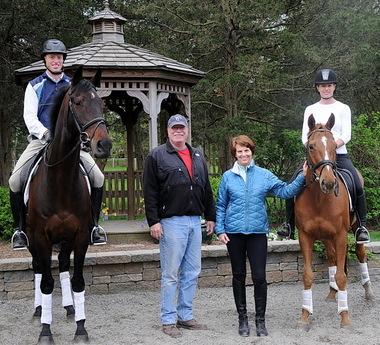 The 2016 Makeover features over 300 Thoroughbreds that began working with trainers from across the country after the first of the year and who will compete in up to two of ten equestrian disciplines to showcase their talents and trainability. 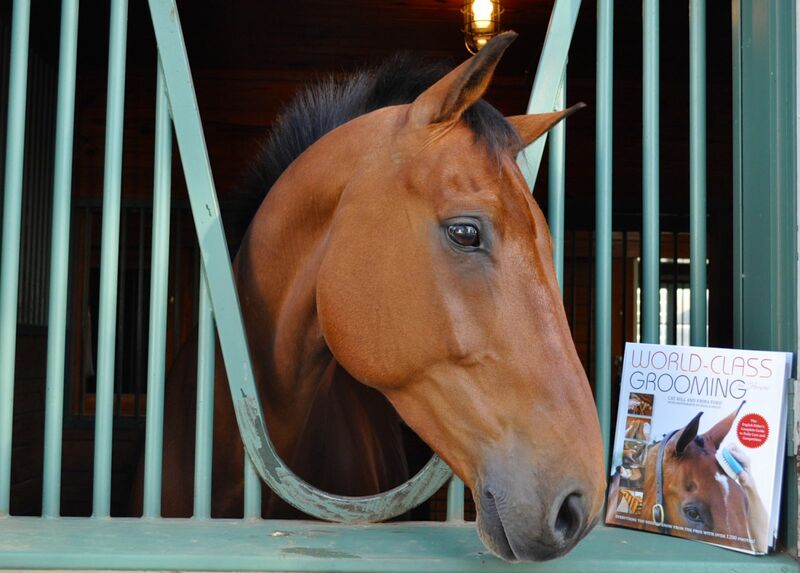 As supporters of the Retired Racehorse Project, TSB is proud to have a number of authors joining Bernie Traurig (creator of DEVELOPING PERFECT POSITION and other DVDs) in this year’s Makeover. BEYOND THE TRACK author Anna Morgan Ford’s OTTB adoption organization New Vocations always has a significant presence at the event, and both Denny Emerson (HOW GOOD RIDERS GET GOOD) and Yvonne Barteau (THE DRESSAGE HORSE MANIFESTO) worked with OTTBs with the competition in mind. 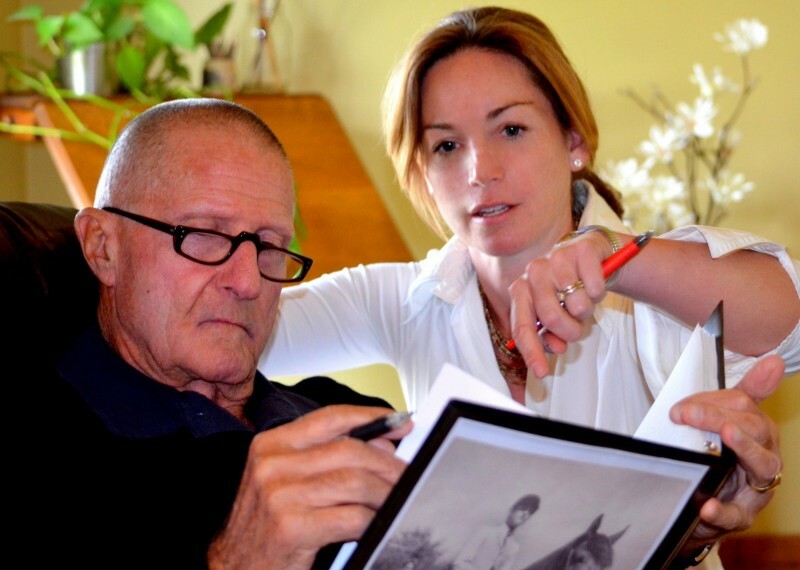 “I did not know of the RRP Thoroughbred Makeover challenge until my friend Lisa Diersen of the Equus Film Festival mentioned it to me,” recounts Barteau. “Since I spent seven years on racetracks, working with Standardbred and Thoroughbred racehorses, and also a few years training ex-racehorses, it seemed like a good thing for me to do. “I started working with SeventyTwo (‘Indy’) in February,” she says. “I found him a bit aloof at first and also somewhat challenging. He likes a good argument and will try to drag you into one if you are not careful. He is also funny, charming, and extremely clever. He learns things, (good or bad), super fast, so I have had to stay ahead of him in the training game. Don’t missing seeing Indy and all the other winning ex-racehorses as they show off what they’ve learned over the last few months and compete to be named America’s Most Wanted Thoroughbred! Tickets for the 2016 Thoroughbred Makeover are on sale now (CLICK HERE). A few equine members of the “TSB herd” are boarders, a few are training projects and in active work, and then there are a number of “retirees” that are allowed the freedom to roam, pretty much as they wish, in quiet companionship. The horses begin and end their days close to the barn, with paddocks and run-ins directly below our office windows, so we all form relationships of proximity with them—and we know their habits and rituals. We watch them eat breakfast and wander down to the stream for a drink. We see them play in the snow and nap in the sun. We notice how they relate to their pasturemates, the naughty pony, the cranky geese. We think of them all with affection, even though they are not ours to ride, train, or care for. This past spring, we experienced a farm event that was profoundly moving; one that brought us all together, inspiring discussion and bringing questions to the fore that we had not yet dealt with directly as a collective group. One morning, the barn manager arrived early in the morning to do chores and found one of the “old fellas,” a Quarter Horse gelding thought to be near 30 years old, in his pasture, unable to move and clearly in severe pain. The veterinarian was immediately called, and upon her arrival she determined the horse had broken his shoulder somehow during the night—a catastrophic accident without obvious cause. The decision was made to euthanize him without delay. The gelding had long been turned out with two other pensioners, as had been arranged by a charitable owner. All three retirees had lived together contentedly as a small herd with little human interference for a number of years. As the veterinarian attended to the stricken gelding, one of his pasturemates startled her by coming over and lying down beside them, facing the injured horse, and remaining there as the old Quarter Horse took his last breaths. It was uncharacteristic of the companion to approach his pasturemate in such a fashion, and it was especially unusual, seeing as three people were present during the procedure. The gelding’s owner wished to come say goodbye before his burial, so his body was not moved right away. Remarkably, the companion by his side remained, and when he did rise, it was only to change position before lying down beside his fallen comrade once again. The third horse in their little herd had also joined them, standing nearby, quietly, for quite some time. The barn manager took a photograph of the scene, not to be macabre but to share what appears to us, at least by our human interpretation, to be the dead horse’s herd holding vigil over a friend’s body. We are all horse people at Trafalgar Square Books, and as we are learning more about horses as sentient beings and the necessity of ensuring that compassion underlies all that we do with them, this incident moved us all distinctly. We discussed it with each other, and in relation to our own horses, and how the event might affect decisions we make on and around horses in the future. We also shared it with a number of our authors, asking for their thoughts and insight. 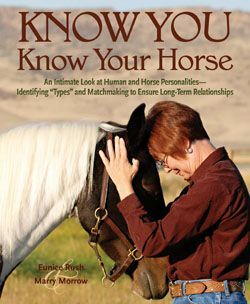 “Horses use their entire bodies to communicate with each other,” explained Sharon Wilsie, co-author of HORSE SPEAK with Gretchen Vogel. “During the course of a day there are several primary conversations that they may have with each other when out in a herd. One of their favorite conversations is simply called, ‘sharing space.’ To our eyes horses who are sharing space together may seem to be doing nothing more than dozing in the sun or standing around doing nothing. However, once you understand the significance of sharing space you will begin to see the inherent bonding and peacefulness that they are participating in at that moment. When a herd member passes away, sharing space with the departed is the most affectionate and connecting conversation that the living can have, not only with the one who has passed away, but also with each other and inside themselves. “Although we can only guess at what grief may feel like for a horse it is easy to feel the power of their hearts as they stand guard over the grave of a loved one. Those of us who have been around animals long enough will probably have experienced a horse lingering near the burial site of one who has crossed over that rainbow bridge. Unlike humans who can easily find distraction from our emotional pain, horses live in the present moment and experience the fullness of all of life, including the passing of another that might have been special to them. 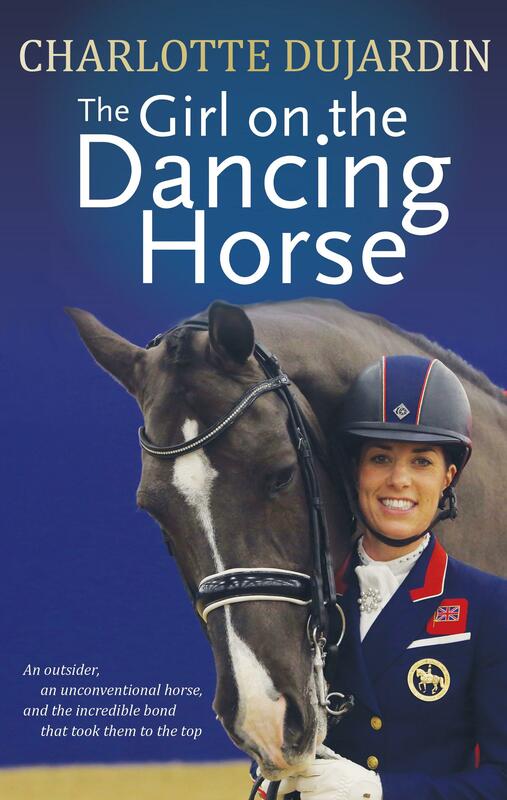 Back in 2009, TSB teamed up with green-living horsewoman and writer Lucinda Dyer to create the first book of eco-conscious tips and ideas for the equestrian community. 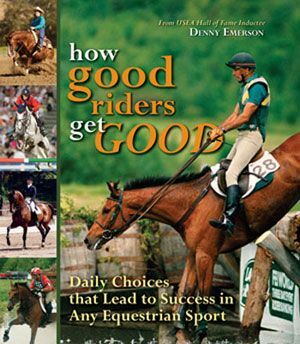 ECO-HORSEKEEPING was called a “handy, inspiring, easy-to-read book” that “provides perfectly prepackaged tips, ideas, and expert advice” by Smartpak Founder Rebecca Minard. “There’s no reason why each and every one of us can’t make owning, riding, and loving horses a planet-friendly activity to be enjoyed for generations to come,” writes Minard in the foreword to ECO-HORSEKEEPING. On the eve of Earth Day 2016, we again consider the role that each and every one of us plays as stewards of the environment at large, and most certainly of the equine environment—which ensures the health and happiness of our horses. Have each of us taken a few small steps toward limiting our footprint, lowering our impact, and preserving our natural world? • Maintenance of buildings and facilities to house horses. • Management of manure and barn waste. 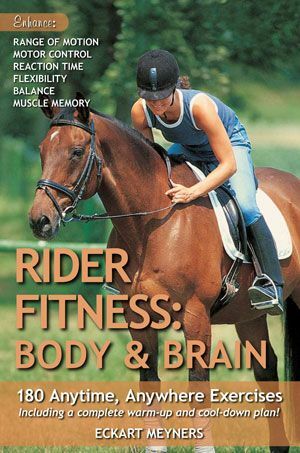 • Transportation of horses to shows, clinics, training facilities. • Runoff from pastures and paddocks. • Overgrazing land both domestically and in the wild. • Overpopulation due to overbreeding and unwanted animals. So how do we put on the green-tinted glasses, and keep them on even when we leave the recycle-friendly world of work and home and head for the barn? 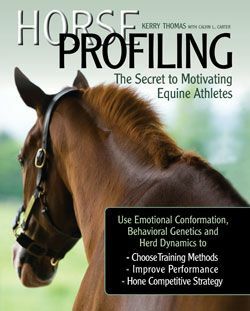 When boarding, “research how your horse’s home could possibly be made safer, cleaner, and less toxic, and bring a list of reasonable steps to the barn’s manager,” recommend Dr. Schoen and Gordon. “Offer to help. Many equestrian operations tend to run at low to no profit, so issues of finances are often the first to be considered when changes are suggested. Even when those changes would lead to a much better environment for both horses and humans, the costs may seem prohibitive. Encourage small, affordable steps, as little changes can ultimately make a significant difference in the horse’s well-being. Lose the Drip: Fix or replace everything in your barn that leaks or drips, be it a faucet, hose, or toilet. A faucet that drips at one drop per second wastes 7 gallons of water a day and 2,700 gallons a year. Go Low-Flow: Make certain all your barn water hoses have nozzles that let you adjust the spray as needed, as well as a “trigger” that allows you to shut off the flow of water completely while soaping up dirty legs or conditioning tangled tails. Reuse Water Whenever Possible: STOP! Before you mindlessly toss that half-a bucket of water from your horse’s stall into the driveway—can it be used to control dust in the round pen or water plants around the barn? Hook Up a Rain Barrel: A rain barrel can be easily connected to one or more of your barn’s downspouts to collect water that would otherwise simply wash away. Use the harvested water to wash trucks, trailers, and farm equipment; water the rings; and cool down hot horses with a pleasant sponge bath. ECO-HORSEKEEPING and THE COMPASSIONATE EQUESTRIAN are available from the TSB online bookstore, where shipping in the US is FREE. CLICK HERE for more tips for an Equine-centric Earth Day. World-renowned authority on animal behavior and creator of the Tellington Method Linda Tellington-Jones invites members of the public to join her and her popular Online Book Club for a conversation with Dr. Allen Schoen about compassion’s role when working with animals, and much, much more. “I’ve had the pleasure of knowing Dr. Schoen for close to 20 years,” says Linda. 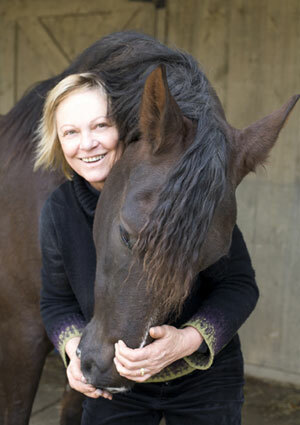 “He’s been on our veterinary advisory board for Tellington TTouch Training and we co-taught a workshop together in the late 1980s—sharing our modalities with horses and dogs—he with his holistic, integrative veterinary approach and I with Tellington TTouch. On Wednesday, March 23, 2016, from 6:00-7:00 pm PT (9:00-10:00 pm ET), you can be part of this revolutionary discussion. 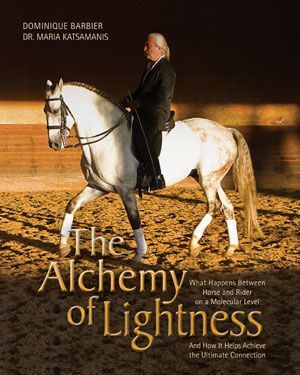 You do not have to have read THE COMPASSIONATE EQUESTRIAN to participate and learn from this extraordinary meeting of two of the world’s most exciting advocates for equine welfare. The Book Club meeting is free and open to all. 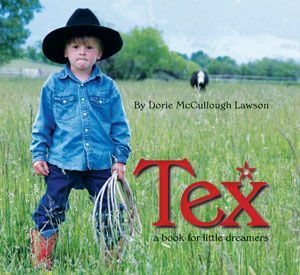 “I love this book! I believe the Compassionate Equestrian concept is a perfectly presented foundation to support our aim to attain a new level of relationship with the horse. At Equitana in Germany this year we celebrated my 40 years of teaching the Tellington Method around the world, and I was asked what my goal is for the next 20 years. Well, my goal is to increase acceptance of recognizing each horse’s individuality so that more people learn to ride, compete, and work with the horse, coming from a place of compassion and understanding. 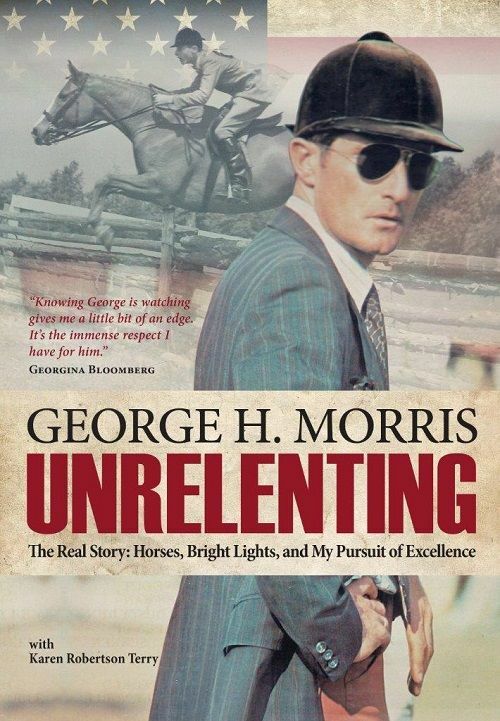 Do you have your copy of UNRELENTING, the George Morris autobiography, yet? This is the book everyone is talking about…and it’s only just been officially released in stores. Come enjoy a short talk by Karen Robertson Terry, Bend resident and George’s right-hand-woman in the writing of UNRELENTING, in conjunction with the unveiling of the painting of one of George’s great horses The Jones Boy by artist Kimry Jelen. Enjoy light refreshments as you browse the store and visit with Karen. Copies of UNRELENTING will be available for purchase and signing. 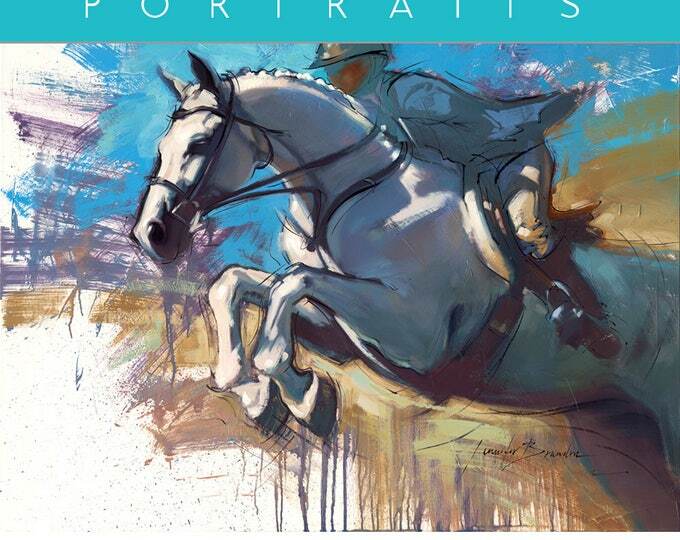 Catch the $86,000 Suncast 1.50m Championship Jumper Classic and meet George Morris at this special WEF-sponsored event. Copies of UNRELENTING will be available for purchase and signing. We’ll be announcing more events in honor of the release of George’s autobiography as they are confirmed—stay tuned! And if you can’t wait, you can order UNRELENTING from the TSB online bookstore, where shipping in the US is FREE. 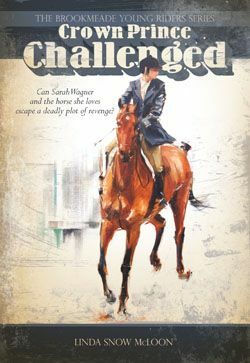 Trafalgar Square Books, the leading publisher of equestrian books and DVDs, is a small company located on a farm in rural Vermont. When Cavalia—the amazing equestrian-themed spectacular that has now toured North America for over a decade—first dazzled audiences in 2003, few people knew of Frédéric Pignon and Magali Delgado. But the whole world was soon abuzz with talk of the display these two remarkable individuals and their unparalleled cast of beautiful horses provided their audience. “Pignon engages in a scene of blissful play with three beautiful white stallions…the impression is one of an intense bond between horses and man—the most emotionally charged moment of the show,” raved Don Shirley in the Los Angeles Times. 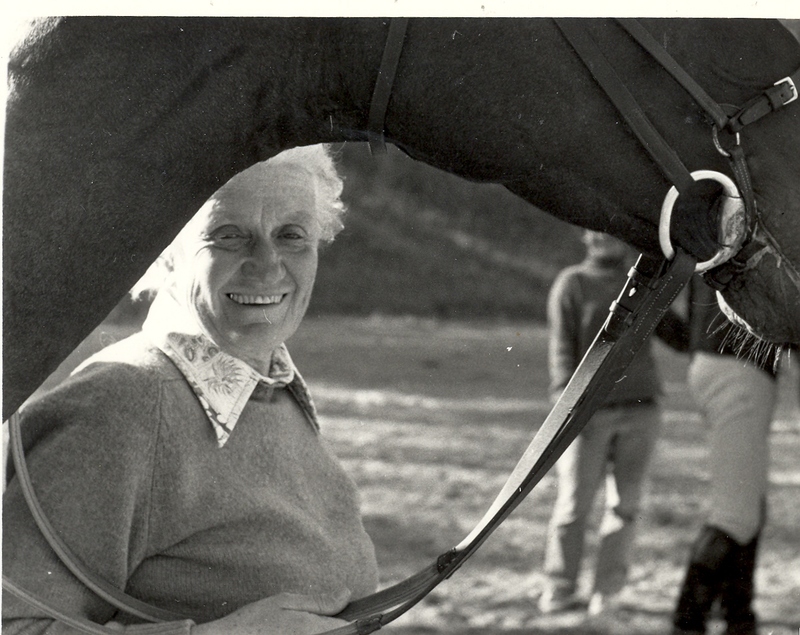 “I believe that Frederic Pignon and Magali Delgado are two of the finest horsemen in the history of horsemanship,” affirms renowned behaviorist, trainer, and founder of the Tellington Method Linda Tellington-Jones. Now, for the FIRST TIME EVER, Frédéric Pignon and Magali Delgado, authors of GALLOP TO FREEDOM and BUILDING A LIFE TOGETHER—YOU AND YOUR HORSE, are coming to the US to teach their methods and share their ideals, and YOU can join them! Frédéric will guide attendees interested in connecting with their horses at Liberty, and Magali (a Grand Prix dressage rider as well as performer) will share valuable dressage principles. Liberty with Frédéric is $400 for 2 days, 1-hour private lesson each day. 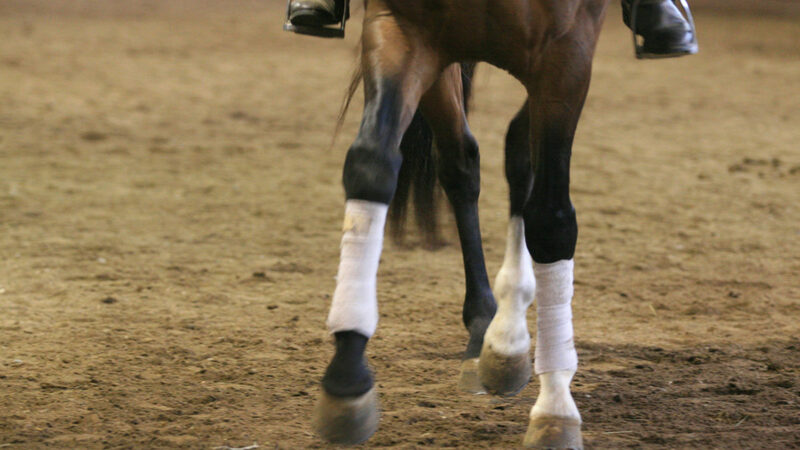 Dressage with Magali is $350 for 2 days, 1-hour semi-private lesson each day. Auditors (limited seating) is $75 per day if confirmed before February 19, $80 per day after. The application and video submission deadline is February 15, 2016, and we understand the clinic is already almost full, so hurry to be part of this amazing opportunity! To apply to train with Frédéric and Magali, register to audit, or for more information, CLICK HERE. 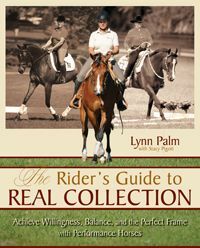 The bestselling books GALLOP TO FREEDOM and BUILDING A LIFE TOGETHER—YOU AND YOUR HORSE are available from the TSB online bookstore, where shipping in the US is FREE. CLICK HERE for more information about Frédéric and Magali’s books. Have you seen Frédéric and Magali’s newest show? Wouldn’t it be wonderful to see it tour North America? We’re packed and ready to head to Springfield, Massachusetts, for EA 2015. Join TSB this Thursday-Sunday, November 12-15, at the Eastern States Exposition, for fabulous clinics from top trainers, riders, and equine experts, as well as a terrific pre-holiday shopping experience. Stop by the TSB booth #846-847 in the Better Living Center for our perennial bestsellers like CENTERED RIDING by Sally Swift (which we published 30 years ago! 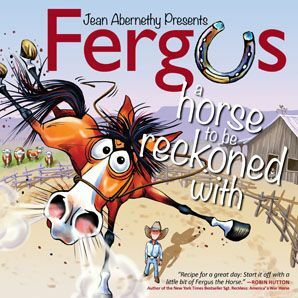 ); brand new titles, such as THE ESSENTIAL FERGUS THE HORSE, COWBOY DRESSAGE, and THE MESSAGE FROM THE HORSE; and great show specials like contests, sales, and a limited supply of TSB exclusive Fergus the Horse coffee mugs! 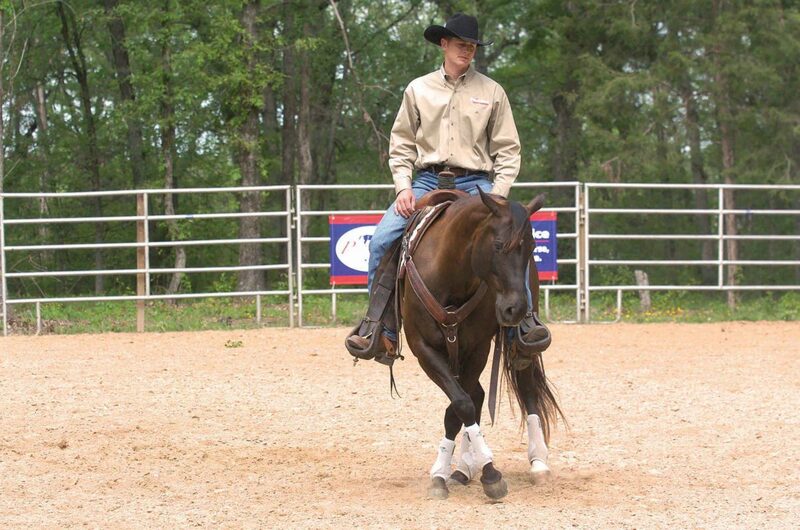 Dan James, one half of the famous Double Dan Horsemanship training duo and co-author of the forthcoming LONG-REINING WITH DOUBLE DAN HORSEMANSHIP, has clinics Saturday, November 14, at 9:30 am (Mallary South) and 4:15 pm (Coliseum), plus Sunday, November 15, at 11:15 am and 3:45 pm (both in the Coliseum). 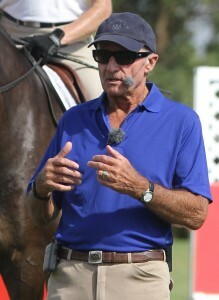 Phillip Dutton, five-time Olympian with two gold medals and author of MODERN EVENTING WITH PHILLIP DUTTON with Amber Heintzberger, has clinics Saturday at 9:30 am and 1:15 pm, and Sunday at 9:30 am and 1:00 pm (all in the Coliseum), plus an “Ask the Expert” session at 4:00 pm on Saturday on the Seminar Stage in the Better Living Center. Meet Phillip Dutton in person at the TSB booth #846-847 in the Better Living Center on Sunday at 2:00 pm! He’ll be answering questions and signing books. 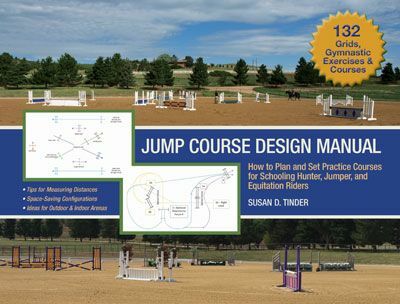 Bernie Traurig, celebrated jumper rider and horseman, and creator of THE AMERICAN HUNTER/JUMPER FORWARD RIDING SYSTEM DVD SERIES, has a talk Thursday, November 12, at 10:00 am (Equine Fundamentals Forum/Mallary South), and clinics Thursday at 1:15 pm and 5:15 pm, and Friday, November 13, at 9:30 am and 1:00 pm (all in the Coliseum), plus an “Ask the Expert” session at 5:00 pm on Friday on the Seminar Stage in the Better Living Center. Susan Harris, co-creator of ANATOMY IN MOTION: THE VISIBLE HORSE and THE VISIBLE RIDER DVDS, and artist contributor to THE DRESSAGE HORSE OPTIMIZED by Jim Masterson and Coralie Hughes, is presenting Friday at 2:00 pm and 4:30 pm, Saturday at 12:30 pm and 6:00 pm (all in the Young Arena), and Saturday at 3:00 pm (Demo Ring/Mallary North). 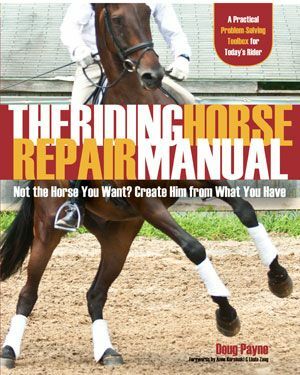 Dr. Joyce Harman, veterinarian and saddle-fitting expert, and author of THE HORSE’S PAIN-FREE BACK AND SADDLE-FIT BOOK, is presenting Thursday at 2:00 pm (Seminar Stage/Better Living Center) and 5:00 pm (Demo Ring/Mallary North), and on Friday at 1:00 pm (Demo Ring/Mallary North) and 11:00 am and 6:00 pm (both on the Seminar Stage/Better Living Center). 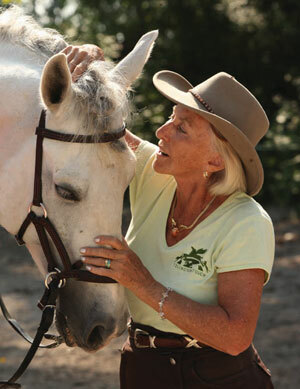 On Saturday she speaks at 10:00 am at the Equine Fundamentals Forum (Mallary South). 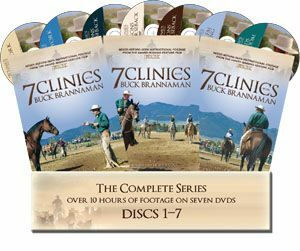 Dr. Allen Schoen, pioneer in integrative veterinary medicine and co-author of THE COMPASSIONATE EQUESTRIAN with Susan Gordon, speaks on Saturday at 1:00 pm (Demo Ring/Mallary North) and on Sunday at 10:00 am (Seminar Stage/Better Living Center). Meet Dr. Allen Schoen in person at the TSB booth #846-847 in the Better Living Center on Saturday at 2:00 pm and Sunday at 11:00 am! He’ll be answering questions and signing books. We look forward to seeing you at Equine Affaire this weekend!